Are you unhappy with the way your smile looks in photos, videos, and the bathroom mirror every morning? It may be some consolation to know that you’re definitely not alone – a 2012 study by the American Association of Orthodontists determined that more than one-third of American adults feel the same way. 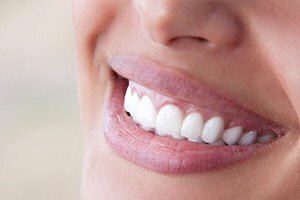 Cosmetic dentistry offers several valuable methods for correcting frustrating flaws, and Dr. Vanderbrook would love to help you explore them more thoroughly during a consultation here in Lakewood. Contact Vanderbrook Family Dentistry today! Invisalign® treatment may be the ideal orthodontic method for image-conscious teenagers, professional adults, and other patients who want to achieve straighter smiles without metal brackets and wires. You will wear a series of clear aligners, each one representing a different stage of teeth as they’re guided towards a new, improved position. When worn, these aligners are very subtle and unobtrusive, and they’re removable as well when eating and practicing oral hygiene. 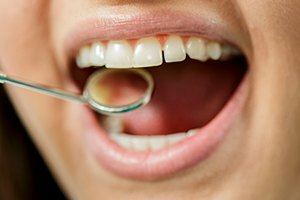 Do you dream of giving your teeth a comprehensive makeover? Veneers may be the easiest way for you to accomplish this goal in just a few appointments! This restoration is crafted from high-quality dental porcelain and designed to be extremely thin – thin enough that it can be fitted over the visible surfaces of teeth in a way that still looks natural. All at once, years and years of cosmetic issues are hidden beneath a brighter, more beautiful appearance. Metal-free restorations are the perfect blend of durable function and aesthetic value, helping patients recover new “teeth” that become a seamlessly confident part of their natural smile. Dr. Vanderbrook can design crowns, inlays, onlays, bridges, and more from all-ceramic materials, which feel comfortable within the mouth and are 100% biocompatible to boot. They’re also surprisingly durable and can last for several years at a time with the help of daily oral hygiene and professional checkups. Cosmetic bonding is a fast, simple, and very effective method for correcting smaller dental flaws, like chips in the enamel or stubborn discoloration. Dr. Vanderbrook will apply a composite resin material to the tooth that’s been carefully shaded to match your enamel and then sculpt it into a subtle addition that hides the offending area from view. 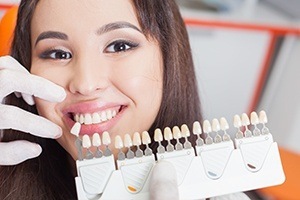 While it’s important to keep in mind that cosmetic bonding isn’t as permanent as full restorative solutions like veneers, patients can still expect to enjoy their improvements for years at a time. Virtually everyone’s smiles will darken in color in their later years, but that doesn’t mean they have to stay that way. At Vanderbrook Family Dentistry, our team offers professional-strength Opalescence whitening in multiple forms – there’s in-office treatment for patients who want results fast and take-home kits for those who prefer added comfort and flexibility. 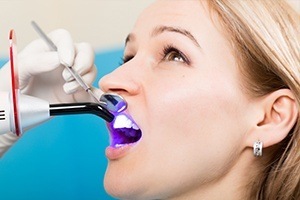 Both options can improve the color of your enamel by several shades!